Scotland coach refuses to raise expectations for the World Cup in France this summer. 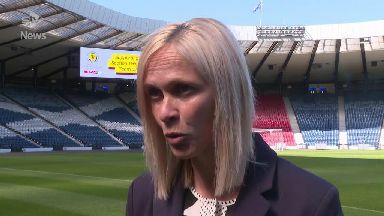 Shelley Kerr has shot down suggestions Scotland can consider themselves dark horses for the World Cup despite their historic win over Brazil. Kim Little fired the only goal of Monday's friendly clash in Murcia as the Scots claimed their first ever win over the South Americans. It was just the boost Kerr's side need as the head coach finalises her preparations for this summer's finals in France. Brazil are currently ranked tenth in the world - ten above Scotland - but Kerr does not believe her team can now be considered contenders to go all the way. And she will not be readjusting her targets in light of this week's win, insisting escaping a group containing world number three England, Japan - who are ranked seventh - and Argentina remains the sole aim for the months ahead. "No I don't think we're dark horses," she said as she helped launch a new sponsorship deal with convenience store chain Spar. "There is a reason we have a ranking system with FIFA. We have to be mindful of that. "But there is absolutely no doubt that on our day we'll give these other nations a game. Our target remains the same - to get out of the group stages." And Kerr is confident her squad will not allow the jubilation of their success against the Samba Girls trick them into believing they are better than they really are. She said: "We've got fantastic human beings in our team who are very, very grounded. "We had a debrief right after the game and the word complacent was raised. We cannot get complacent because this was only a friendly game." Scotland kick off their World Cup campaign against the Auld Enemy in Nice on June 9.